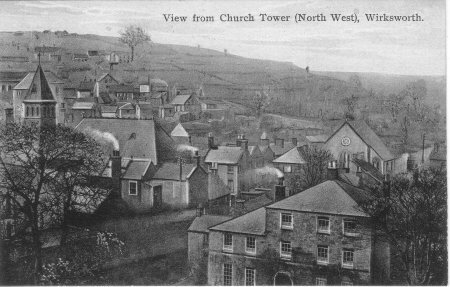 These fine drawings, perhaps based on photos, show views North-West and North-East from the church tower at Wirksworth. The scenes shows winter, with a strong wind from the East, so the artist must have been freezing if he was drawing in the tower! the Red Lion Inn to the right of which are The Vaults run by Charles Wright, wine & spirit merchant. The houses in between can be seen on an Interactive Map of the centre of Wirksworth on this website. Behind the Vicarage is the Congregational Chapel on Chapel Lane. Today, the fields in the distance have disappeared because of the expansion of Middlepeak and Baileycroft Quarries. 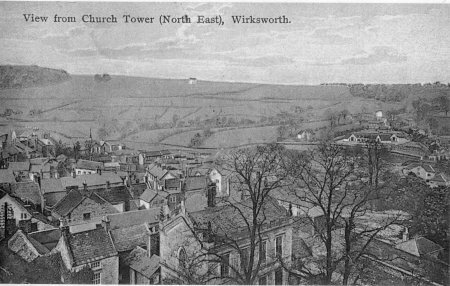 In the centre at the bottom is Wirksworth Grammar School (the original building) which can also be seen on the Interactive Map marked "G" in green.